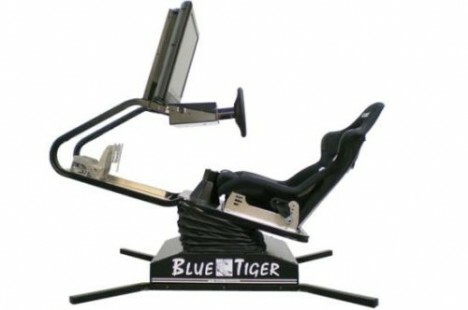 Video game fans will get more realistic action and exhilarating experience with the BlueTiger Motion Simulator. Gamers get to experience very realistic motion, be it racing or flying, much like in a real vehicle or situation. In BlueTiger, the seats, monitor and controls all move in sync with the user. BlueTiger Motion Simulator technology focuses on alternating the speed of movements in proportion to the game to give users the impression that they are experiencing the sensations of speeding, slowing down, going uphill, going downhill or braking. The effects of the motion simulator are made more real via its replication of visual cues in the game such as engine vibrations, bumps, road conditions, etc. BlueTiger Sim can be purchased in parts or as a whole. The different components of a Bluetiger Sim can be ordered by users and then assembled for a more sensational gaming experience. Owners can even customize their rides as the sim is compatible with most video games accessories. The Games tab has listed sixteen of the most desirable racing and flying games that are now compatible with BlueTiger and the number is still growing.